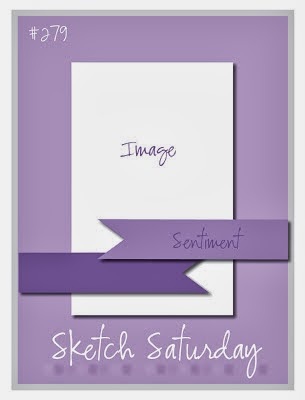 It is the lovely Lizy's DT week this week over at Sketch Saturday which means she has had to organise a sponsor, a guest designer and design the sketch. The sketch is fabulous (of course!) and Lizy herself is our sponsor this week! Lizy is a Stampin Up demonstrator and given that I used to be a demo myself I still have a very big weakness for anything SU! Lizy is offering a fantastic prize bundle consisting of a stamp set, patterned paper, ribbons, buttons and clips - an amazing prize bundle, I'd quite like to win it myself! I have turned the sketch on its side (rotated 90o clockwise) and I have all my flags going in the same direction (I just couldn't make it work with some coming up given the orientation of my card!). I've used the new SU massive chevron background stamp, the Simply Stars stamp set as well as some of the new In Colours, not to mention that amazing SU glitter paper which is one of the best I've come across. I've added in some peach bakers twine and some gems to finish off. As I mentioned above, Lizy is sponsoring this week's sketch and she has a great prize on offer so make sure you join in with this week's challenge.